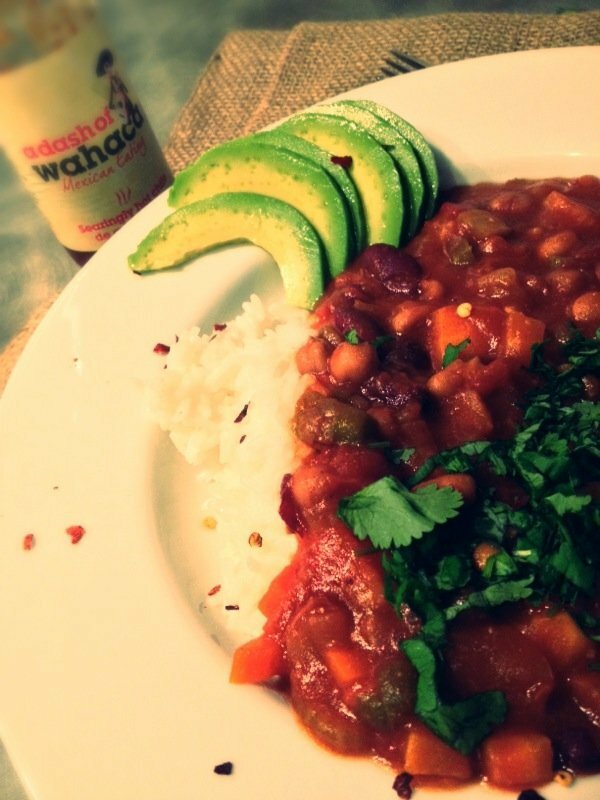 Slow cooker vegetarian chilli is a very economical, filling easy family recipe. It’s a great way to get kids to eat loads of veggies – even my reluctant vegetable eater always seems happy to eat them in the form of a chilli! This recipe is not too spicy more of a spicy warmth so it’s perfect family food. I’ve really started to embrace slow cooker meals lately, they seem to fit so well into busy hectic family life and encourage me to do far more one-pot cooking which saves time on washing up and tidying, always a good thing! Heat the slow cooker on the low setting. I have a slow cooker pan which you can use on the hob to get things started - so I add a splash of oil to the slow cooker pan over a low heat on the hob, put the onions, garlic, celery and spices in and sizzle for 5 minutes. Add the carrots, peppers, tomatoes, tomato puree and beans and one tomato can of water. Add a good pinch of salt and a grind of pepper. Bring the chilli to the boil and then transfer to the slow cooker for around 8 hours on the low setting. Before serving if the chilli needs thickening up - simply stir a couple of tsp of cornflour into a drop of cold water and stir through the chilli to thicken. This recipe was created as part of the Veganuary drive to eat vegan meals and I’m happy to say one we all really enjoyed. The leftovers were served in crispy skinned jacket potatoes the next day – admittedly with a dollop of sour cream… but just who can eat a jacket potato without the sour cream…. mmmmm. Love your leftovers – leftovers are lovely taken in thermos as packed lunch, as a jacket potato topping, as a quesadilla topping or simply freeze for use another day. Mmmm Real Family Food.